Following the lead single, “Trust Fund Baby”, and the third song on the record, the tune is billed as “Chapter 3 of the story” unveiled in the band’s new concept album. 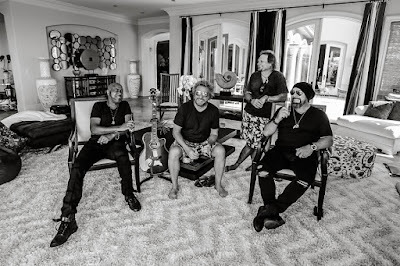 "The 10 songs on the 'Space Between' are not just a bunch of new songs grouped together on an album,” explains Hagar. “They were sewn together conceptually for a complete mental, emotional and physical experience (kind of a Three Lock Box). Once I had the overall vision, the lyrics and music began to just flow through me." Due May 10, “Space Between” marks the first full studio release by the band, which also features bassist Michael Anthony, drummer Jason Bonham and guitarist Vic Johnson. The group will perform tracks from the set when they hit the road for a spring US tour that will begin in Reno, NV on April 19. Every ticket purchased for the tour will include one CD and digital copy of "Space Between" (note: a Lewiston, NY show is not part of this offer); ticket purchasers will receive instructions on how to redeem their copy, which will be mailed to them on May 10, the day of its release.